Frequently Asked Questions About VB.NET In Easy Steps Tutorials | VB.NET In Easy Steps. 1) What is VB .NET In Easy Steps ? "VB .NET In Easy Steps" is a new approach towards learning Quickly VB .NET using real time short movies, which will show you how to do a specific task in VB .NET. 2) What is the best recommended screen resolution for viewing this content in this CD? This page is best viewed with a resolution of 1024 x 768 pixels and with Internet Explorer(IE) 5.0 and above. 3) When I Click on the video a register dialog box pops up. What should I do? 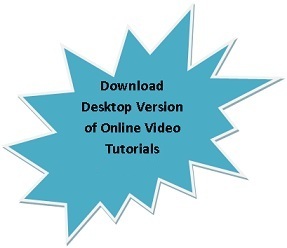 Please register the Tutorial CD as mentioned in the purchase page so as to view the video in the Tutorial CD. 4) Where can I find more information regarding the price and other information about the CD ? Please contact KTS InfoTech or visit our web site http://www.ktsinfotech.com for more details.